One of my best fiber art buds and I went to Stitches South this weekend. Woohoo! 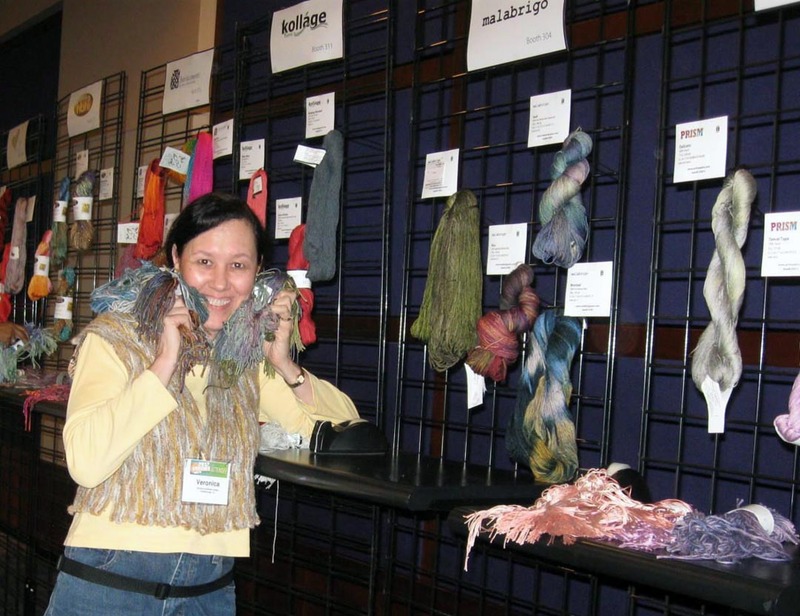 It was full of yarny goodness—sensuous fibers (one vendor booth had mink yarn! ), mouthwatering colors, and this year, lots of beaded bling. where they have the yarn sampling of yarns from 12 differenet suppliers. 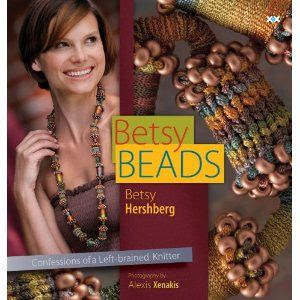 Betsy Hershberg's new book, Betsy Beads: Confessions of a Left-Brained Knitter, was a focal point at several vendor booths and expo presentations. Betsy Beads by Betsy Hershberg. several knitted shawl samples made up with Rosetti Polaris by Universal Yarn, a wool blend infused with sequin payees (the dazzling beauty of this yarn and these garments can only be experienced in person). Get a jump on holiday projects... all of the patterns for these samples were FREE ones from Universal. One of the vendors was wearing a great "recycled creation" that she graciously allowed me to photograph. Is this vest not ingenious? It's crocheted with pop-tops (you know, recycled from soda cans). 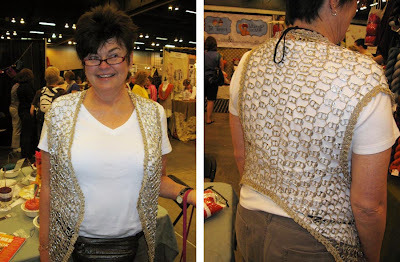 The crochet was very fine and lacy but the aluminum pop tops gave the vest weight and drape. I purchased a few "high density" items for my stash and got Betsy to sign a copy of her book for me. a hank of blue sock yarn (on sale) for my Sky Scarf. Sheri and I also splurged and got two To-Go orders of Limoncello Bread Pudding from Carrabba's. We brought it back to the hotel and indulged with a late night snack.